A pair of B-2 Spirit stealth bombers, callsign DEATH 11 and 12, have joined a trio of B-52s at Royal Air Force Base Fairford, a long-time forward staging base for USAF strategic assets in the UK. The presence of US nuclear bombers, the B-2 in particular, along with the massive allied training war game known as BALTOPS ‘15, of which B-52s are playing a role, and the myriad of fighters, tanks and ships already operating on Russia’s doorstep, is the largest flashing of sword yet for U.S. and its allies in the region. The Pentagon says that the B-2s conducted hot-pit refueling and engine-running crew change tests during their time on the ground in the UK, but this is only a small portion of the story. The bat-winged super-bombers went out on a mission and are now heading back to the base as this is being written. It would appear that they are now officially forward staged, at least for the time being, out of the United Kingdom. Meanwhile, the three B-52Hs that forward deployed days earlier to RAF Fairford look like they are going to take on a larger role in region’s numerous training exercises. Originally, the USAF had stated that they would be used as naval mine layers for the large BALTOPS ‘15 exercise that in underway on the Baltic Sea. This was a fairly limited mission, but one pointed directly at Russia whose ports on the Baltic could be temporarily closed due to such a mining operation. Now it looks like the B-52s may provide other capabilities to BALTOPS as well as supporting the U.S. Army’s annual European exercise known as Saber Strike, much of which will be occurring near the Russian border. The B-52s have been warming up their European and Arctic flying capabilities over the last few months, so it is no surprise that they would be forward deployed at some point to the European theater, but the inclusion of their B-2 counterparts is. All this occurred as a mass of surveillance planes were orbiting over the Baltic Sea. Aviation radio and transponder trackers had US, NATO, Swedish and Russian signals intelligence aircraft operating in the same general vicinity. Considering BALTOPS includes a huge array of NATO and Scandinavian warships and aircraft, there is little puzzlement why Russian surveillance aircraft would have great interest in monitoring the exercise. Then someone has to monitor the monitors I guess. There is also a need to support certain ‘contingency’ operations should an issue arise during the G-7 summit. The fact of the matter is that deploying the B-2, not to mention a handful of B-52s, to the region has greatly upped the saber rattling equation between the U.S, its allies and Russia. 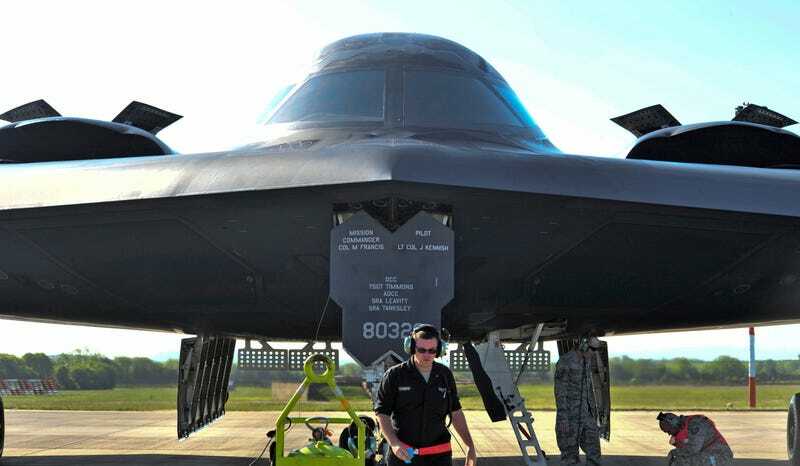 There is not an airborne weapon system that poses a greater threat to Russian interests than the B-2, and the aircraft’s very presence in a geographical region is known to vastly increase tensions. Such a training event by the Air Force’s Global Strike Command does clearly show that American can forward deploy its hardest hitting air power anywhere in the world, but that is not a lesson that needs to be taught to anyone anymore. The presence of the most powerful air combat capability the world has ever seen near Russia maybe is. The big question is what don’t we know? Obviously these movements, which some would call provocative, are approved from the top down. Why send this message now? It surely is not a random escalation in deterrence. Maybe it is in response to what many see as a looming wide-spread invasion of Ukraine by regular Russian forces? Maybe it is a reaction to something else? But if we are increasing the cadence of our march into another all-out Cold War, these details would sure be nice to know.